What is the Best Nail Oil for Gel Manicures? It's Nourish! Hands down, the most effective and luxurious formula to promote healthy nails and cuticles is Nourish by Gelish. This blend of 6 natural oils plus Aloe, Vitamin A and Collagen help give nails flexibility and moisture they need to prevent dehydration. 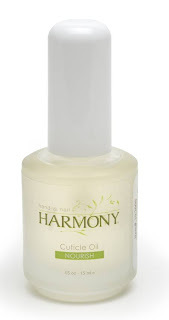 Daily use will keep gel manicured nails, polished nails, and nail enhancements strong and flexible. Encourage your gel manicure clients to use Nourish every day. Repeated use has a cumulative effect, allowing the natural oils to fully penetrate into the natural nail for maximum results. No other oil does the job like this one! Easy brush applicator makes is ideal for a controlled, mess-free application. (Not as messy as dropper). Why is frequent application of Nourish nail oil important? This powerful blend enhances the strength, hydration and overall healthy appearance of nails and cuticles during long wear gel manicures. Kukui Nut Oil - A very effective skin softener, conditioner and moisturizer. Kukui Nut oil naturally contains vitamins A, E, and F, which are vital nutrients that restore the skin's suppleness. Originally discovered by native Hawaiians many centuries ago, it uses include treatment for minor sunburns, dryness and for softens and moisturizes the dry skin. It's also notable effective for reducing the wrinkled, aged appearance of dry skin and fine lines. This is a great way to improve the appearance of wrinkled, aging hands and fingers! Sweet Almond Oil - This amazing oil promotes strong nails and healthy cuticles with it's rich and powerful natural properties. Sweet almonds are rich in nutrients, protein, vitamins and minerals and contain water, fats, proteins and cellulose. Sweet almonds are rich in calcium, iron, phosphorus, sodium, potassium, magnesium, chlorine, sulfur, copper, zinc, manganese, and niacin. Sweet almonds also contain vitamin B1, vitamin B2, vitamin C, vitamin A, vitamin D, and vitamin E.
Sesame Oil - Known for its soothing and healing properties, Sesame oil is naturally rich in Vitamin E and B complex. It also has a high content of minerals such as calcium, magnesium and phosphorus. Safflower Oil - Safflower oil contains the highest source of natural polyunsaturated fats than in any other type of vegetable oil. It contains almost 79% polyunsaturated fatty acids (linoleic acid). It also contains 13 percent of monounsaturated fatty acids (oleic acid) and only 8% of saturated fatty acids. The other essential nutrients present in safflower oil are omega-6 fatty acids, cis-linoleic acid, vitamin E, etc. These properties make Safflower oil essential for people with dry skin and brittle nails. Daily topical use is especially beneficial for intensively moisturizing the skin, especially during winter, making skin smooth, soft and healthy. Grape Seed Oil - Grape Seed oil is a natural anti-oxidant and contains palmitic, palmitoleic, stearic, oleic, linoleic, as well as alpha linolenic, icosanoic, icosenoic and docosanoic fatty acids. Linoleic acid is very important for the health of the skin as well as cell membranes. This highly effective, non greasy oil is perfect for repairing damaged or stressed tissue and possess regenerative and restructuring qualities which allow for optimal cuticle moisturization. Retinyl Palmitate (Vitamin A) - Powerful Vitamin A, it is revered as an effective antioxidant and skin-cell regulator. Vitamin E Oil - A superb anti-oxidant and healing ingredient for the effective treatment for dry, cracked cuticles. It naturally helps boost collagen production helping to build strength and flexibility in the nails. Daily application to nails and cuticles helps to rehydrate and smooth them as well as prevent future cracks. Soluble Collagen - A protein that's important for nail strength. Collagen restores moisture to the nail and cuticle and promotes flexibility. Also known as an excellent skin-Conditioning agent. Organic Aloe Vera - A natural cellular re-generator with anti-bacterial and anti-fungal effects. Aloe, Collagen and Vitamin E work synergistically in this highly effective nail oil formula to maintain the skin's elasticity and suppleness and keep vital moisture in.